Observational data of rainfall from a rain radar in Darwin, Australia, are combined with data defining the large-scale dynamic and thermodynamic state of the atmosphere around Darwin to develop a multicloud model based on a stochastic method using conditional Markov chains. The authors assign the radar data to clear sky, moderate congestus, strong congestus, deep convective, or stratiform clouds and estimate transition probabilities used by Markov chains that switch between the cloud types and yield cloud-type area fractions. Cross-correlation analysis shows that the mean vertical velocity is an important indicator of deep convection. Further, it is shown that, if conditioned on the mean vertical velocity, the Markov chains produce fractions comparable to the observations. The stochastic nature of the approach turns out to be essential for the correct production of area fractions. 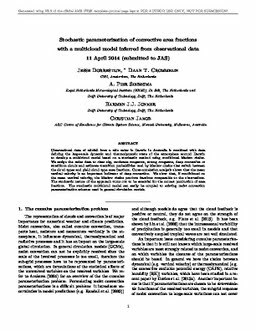 The stochastic multicloud model can easily be coupled to existing moist convection parameterization schemes used in general circulation models.